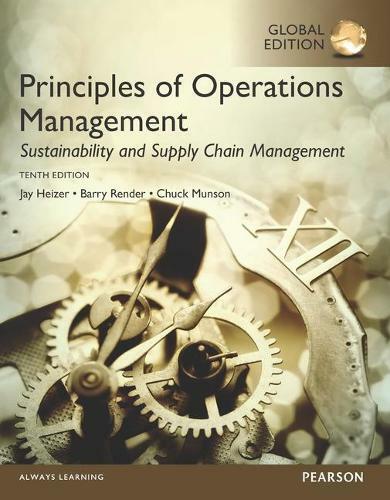 Principles of Operations Management: Sustainability and Supply Chain Management presents a broad introduction to the field of operations in a realistic and practical manner, while offering the largest and most diverse collection of issues on the market. Problems found in the Tenth Edition contain ample support-found in the book's solved-problems and worked examples-to help readers better understand concepts important to today's operations management professionals. MyOMLab ™ not included. Students, if MyOMLab is a recommended/mandatory component of the course, please ask your instructor for the correct ISBN and course ID. MyOMLab should only be purchased when required by an instructor. Instructors, contact your Pearson representative for more information. MyOMLab is an online homework, tutorial, and assessment product designed to personalize learning and improve results. With a wide range of interactive, engaging, and assignable activities, students are encouraged to actively learn and retain tough course concepts.